Gigabit Ethernet LAN interface provides high-speed connectivity for faster downloads and demanding applications. 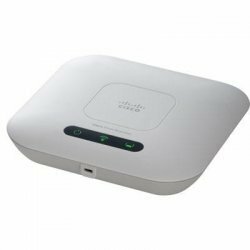 Selectable-band wireless access lets you switch bands to minimize interference from other office devices and improve performance. Power over Ethernet (PoE) support enables easy installation without the expense of additional wiring. Intelligent quality of service (QoS) prioritizes network traffic to keep critical network applications running at top performance.